THE BOOK 'SPRINT KARTING' OFFERS THE GREATEST AMOUNT OF PRACTICAL INFORMATION EVER ASSEMBLED ON AMERICAN KARTING/GO KART RACING TO HELP KARTERS MOVE UP THE RANKS WITH "THE UNFAIR ADVANTAGE". 'SPRINT KARTING' COVERS U.S. SPRINT, SHIFTER KARTS, SPEEDWAY OVAL, and DIRT KARTING to help American karters improve, start winning and get competitive. Jean Genibrel, the most read karting book author in the world, has been involved in karting for nearly four decades and has sold nearly 70,000 books. He has written eight books and a multitude of magazine articles on a variety of subjects like karting, stock car racing, road racing, and open wheel dirt cars. Jean was involved in all categories of auto racing and karting as a driver, engine and chassis builder, and tuner; four-stroke, two-stroke, Shifter, dirt oval, and Sprint as well as in stock car, road racing, and open wheel. Jean was the editor for "Kart Racer Magazine", "Rod Action" and "Street Machines" and contributed to several other publications like "Circle Track", Sports Car, "Bracket Racing", "National Kart News", "Open Wheel" and others. With the books, all his efforts were directed at educating and assisting karters to get into karting easily and to move up the ranks effectively. Jean has helped thousands of karters become acquainted and improve in the sport of karting. As a race professional the author has gained firsthand experience with the mistakes and errors many have made in karting and other forms of racing. The knowledge was tabulated in "Sprint Karting", "The Yamaha KT100" and "Karting, a Complete Introduction". The author publishes APPLIEDSPEED.COM a technical auto racing blog and e-commerce website where his books are available to purchase. 'Sprint Karting' also includes info for Speedway Oval, Enduro, and Shifters. Engines, tires, clutches, chains, steering, axles, seats, safety, instruments all share similarities. 'SPRINT KARTING' is a kart racing technical book of over 100 pages and several hundred professional photographs and diagrams dedicated to helping karters with the information they need to progress in karting. The book is a complete guide to kart racing for the US and Canada. It gives karters “The Unfair Advantage” with the aid of “The Progressive Learning Curve”. A special chapter is dedicated to Shifter karts and all their generic technology like the carburetors, gearboxes, brakes, spark plugs, jetting and more. This karting book explains some of the rules basics. Two-stroke engines have their own specs like this KT100. Four-strokes also have very specific rules. The book does not include all the rules as they change on a yearly basis and they may vary from region to region. 'SPRINT KARTING' is an absolute must-read by any U.S. Karter in any form of go-karting: Sprint, dirt oval, Shifter, speedway, asphalt, or just for those that go “practice karting”. The book takes the karter through all the fundamental information of the mechanical and technical information of kart racing to help karters move up the ranks of karting competition. From chassis setups to carburetor tuning, to clutch adjusting to driving and much, much more. How do I get into karting?" How do I become a race car driver? How do I improve in karting? WHO SHOULD READ 'SPRINT KARTING'? Anyone involved in kart racing in the U.S.A. who wishes to get more competitive, to go faster and learn the ins-and-outs of the technology involved in the sport. ACCESSORIES: Tools, spares and lubricants, tools, towing, loading checklists and more. PREPARING THE CHASSIS: Chassis setups, inspecting for damage, measuring tires, axle removal, brake rotor installation, brake inspection, axle, bearings, brake bleeding, wheel alignment, tech list, handling cures, setting the toe, and more. CARBURETORS: Maintenance, mixture, pop off, air filters, all carbs, rebuilding, blueprinting, tuning and more. ENGINES: Tuning parameters for two- and four-strokes and shifter karts, specifications, plugs, fuel and much more. PREPARING THE ENGINES: Valve adjustment, mounts, oil, break-in, starting, breathers, compression, tanks, common problems and much more. CLUTCHES, GEARS, CHAINS: Clutches types, stall speed how and why, adjustment, care, setup, third bearing, breaking and adjusting the chain and much more. For two- and four-strokes and shifter karts. PRACTICE DAY: Importance of practicing, reading the plug, tuning the carb, flags, loading and at the track checklists, settings, between heat checklist and much more. RACE DRIVING: Controlling the "Self", emotions, positive thinking, focusing, concentration, visual fields, lines, apexes, braking points, the six sections, passing and much more. RACE DAY: Setup, carb settings, gearing, tuning, the start, practice, qualifying, the race and much more. MAINTENANCE BETWEEN RACES: Visual inspection, axles, and bearings, brakes, charging the battery, reed valves, record keeping and much more. 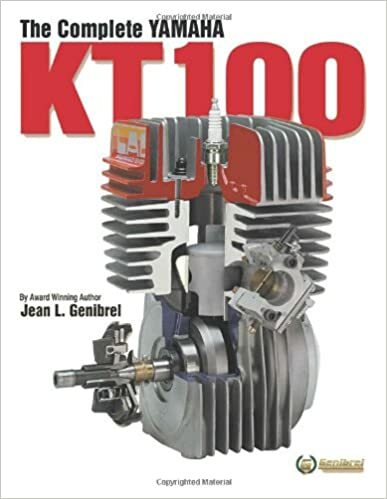 AND A SPECIAL CHAPTER STRICTLY ON "SHIFTERS": Engines, fuel system, carburetors, the needle, float and jets; tuning, starting, spark plugs, radiator care, brakes and bleeding, the balance bar; reading the plug, setting the air/fuel mixture, air correction graphs, altitude correction graphs and much more. GET FREE PISTON LOCATION vs PIN OFFSET XL CALCULATOR. Free shipping and discount with the purchase of 2 or more of the books. If you have not yet purchased the equipment to go karting or you are getting ready for your first outing you need to read "KARTING a COMPLETE INTRODUCTION'. If you are interested in getting into kart racing buy a copy of "KARTING a COMPLETE INTRODUCTION' and learn how to go karting safely, economically and have more fun at it. Images seen here may differ from those in the books.